The ASA 73 Custom Pro softball bat is a long 2 14” barreled softball bat with a flared medium 15/16” handle transitioning to a large knob for optimal comfort, exceptional balance and a light swing feel. Both power hitters and contact hitters love the ASA 73 for both power and bat control. 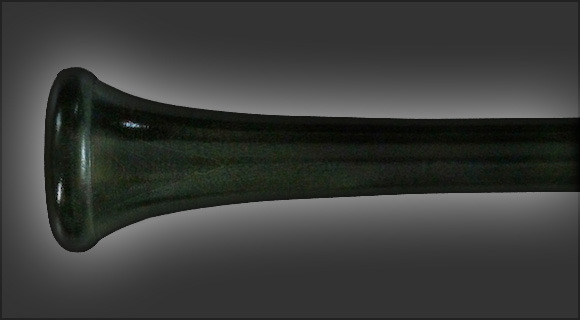 This bat customizer is an approximation of the colors and engraving you have chosen for your bat. Colors vary from bat to bat as different pieces of wood take stain colors differently. The shape of the bat and knob in the customizer is not meant to represent the model you have chosen. Please do not rely on the customizer to depict the exact model and color of the bat you are ordering. Exact bat shapes and knobs are shown on the page for that particular bat model. By checking this box I acknowledge that I have read and understand the limitations of the bat customizer. Great quality bat! On my second bat and I feel like every time I use it my hits get better! 166 1 Great quality bat! On my second bat and I feel like every time I use it my hits get better! The league I'm in switched to wood bat for the fall. So I had to find a wood bat asap. Came across XBATS and boy was I impressed. I Looked all over the web trying to find a bat to give me pop just like a metal bat. My order came faster than expected which also was a big plus. As soon as I got the bat i couldn't wait to hit. Did some bp prior and immediately fell in love with the bat. Also loved the fact that I could customize the bag to my liking. 136 1 The league I'm in switched to wood bat for the fall. So I had to find a wood bat asap. Came across XBATS and boy was I impressed. I Looked all over the web trying to find a bat to give me pop just like a metal bat. My order came faster than expected which also was a big plus. As soon as I got the bat i couldn't wait to hit. Did some bp prior and immediately fell in love with the bat. Also loved the fact that I could customize the bag to my liking. I have now ordered two custom xbats and when I tell you it is worth every penny it is. It is durable with great pop. I have the best balanced custom bats both made to my specifications and it had a great feel to the swing. The best part is that when you order your custom bat they come in no time. Well recommended bats over all. 129 1 I have now ordered two custom xbats and when I tell you it is worth every penny it is. It is durable with great pop. I have the best balanced custom bats both made to my specifications and it had a great feel to the swing. The best part is that when you order your custom bat they come in no time. Well recommended bats over all. I recently purchased this bat and all i can say is the whole team loves it. It has already become the teams go to bat. Best wooden bat i have purchased to date. Not only does it live up to its expectations, it has lead to a 4-0 start for our team! 114 1 I recently purchased this bat and all i can say is the whole team loves it. It has already become the teams go to bat. Best wooden bat i have purchased to date. Not only does it live up to its expectations, it has lead to a 4-0 start for our team! I am very excitied for my new wood softball bat made to my requirements. The product is the best in the industry period. I look forward to using the bat this week. Best bat I've used in 10 years of playing softball. Bounces off the bat like metal. Worth every penny. 71 1 Best bat I've used in 10 years of playing softball. Bounces off the bat like metal. Worth every penny. high quality is an understatement. I have purchased several of these bats. Would recommend to anyone in a wood bat softball league. 63 1 high quality is an understatement. I have purchased several of these bats. Would recommend to anyone in a wood bat softball league. When choosing the weight of the bat, many people ask what does -2 or -3 or even or +2 mean? The weight differential is the difference between the length and the weight. So a 34 inch bat with a -3 would weigh 34 - 3 = 31 ounces. A 33 inch bat with a +2 would weigh 33 + 2 = 35 ounces. Subtract or add the weight differential from the length and that will give you the weight in ounces. Now you can order your custom X Bat bat with YOUR own signature- just like the pros have done for years. Your custom X Bat can be engraved with your ACTUAL signature. Cost for the first bat is $20.00, subsequent orders are only $5.00 extra once we have your signature on file. You will need to send your signature to us, signed with a black Sharpie (a regular pen is too fine), on a plain, white sheet of paper (no lines). Make it large enough to easily read and we can size it accordingly. Please send us your signature and include a copy of your email order confirmation. Your order will ship within 2-3 weeks after receipt of your signature. Now you can have your bat made to the exact specifications as the pros. Rush Production Orders have a 5 business day turnaround time starting the day after the order has been received. Rush Production means you jump to the front of thousands of people before you and is subject to availability of wood billets for your model, length and weight. If the correct billets are not available immediately for your bat, Rush Production status will put you first in line when they do become available. We produce new billets weekly and the range of weights is not predictable with a natural material like maple. There is a $30. Per bat charge for rush production and overnight shipping is also available in addition to the Rush Production charge. A single order cannot be mixed with Rush Production and Regular Production as there would be two separate shipments and two separate shipping charges will be incurred. X Bats is offering a ONE TIME REPLACEMENT WITHIN THE FIRST 101 DAYS FROM THE ORIGINAL PURCHASE DATE. This warranty covers all manufacturing defects and cracks or breaks from normal usage hitting regular baseballs. The policy does not cover: bats that have been abused, altered or mistreated. Bats used in commercial batting cages are not covered under this policy. Any bat hit with dimple balls or rubber balls is not covered under this policy. Flaking of the grain on ash bats is a normal consequence of hitting with ash bats and is not covered under this policy. For your ONE TIME WARRANTY replacement you must e-mail our X Bat Warranty Department at CustomerService@XBats.com. All returned bats must have a Return Authorization Number by email. (Your e-mail should include your Name, shipping name and address, as well as a copy of your purchase receipt) The replacement bat will be the same size, color and spec as the one returned. Replacement bats will not be covered by the 101 day warranty policy. X Bat will pay for return ground shipping on any bat that is shipped within the Continental United States. All shipping charges on bats returned to us must be paid for by the customer sending the return. For replacement bats that need to be shipped to Alaska, Hawaii or overseas the consumer is responsible for paying the shipping charges back to them as well as to our return department. The return must include a copy of the original purchase receipt. ©2019 X Bats. All rights reserved. X Bat is a registered trademark of X Bats and is protected under the law. Any violation of US Patent and Trademark law will be prosecuted to the fullest extent of the law. The great thing about custom wood bats is the ability to choose a bat that fits your age, size, strength and game. Parameters such as knob style, handle thickness, barrel size and balance can all be dialed in to get the most comfortable bat in your hands. When you are comfortable with your equipment, you go to the plate each time with more confidence. Confidence translates to performance. We want you to have the confidence in your equipment to maximize your performance on the field. Please use our custom bat model recommender below to receive advice on which bat is right for you. You'll be contacted by email within 24-48 hours of submitting your request. What type of knob do you like? Do you play with aluminum or wood or both? What is the most important thing you look for in selecting a wood bat?